The Slow Keys feature of Mac OS X can be helpful to people who have problems with repeated keystrokes. This feature can be used to change how long a key has to be pressed before it is recognized by the computer. 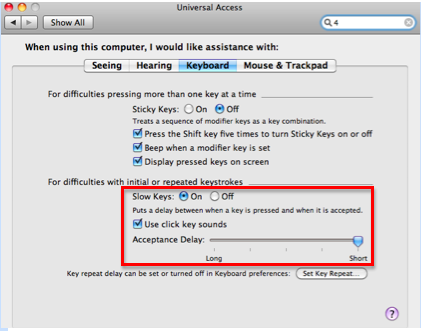 By setting a long acceptance delay, repeated keystrokes can be minimized. 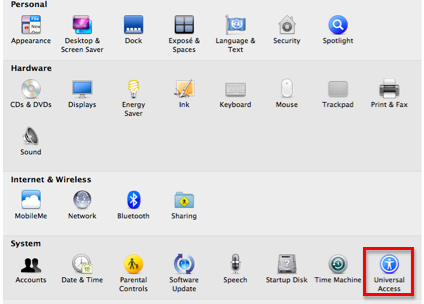 Choose, Apple System Preferences, Universal Access. In the Keyboard pane, select the On button next to Slow Keys. Check the box next to “Use click key sounds” to hear a click sound as feedback each time you press a key. Use the Acceptance Delay slider to adjust how long you have to press a key before it is recognized by the computer.